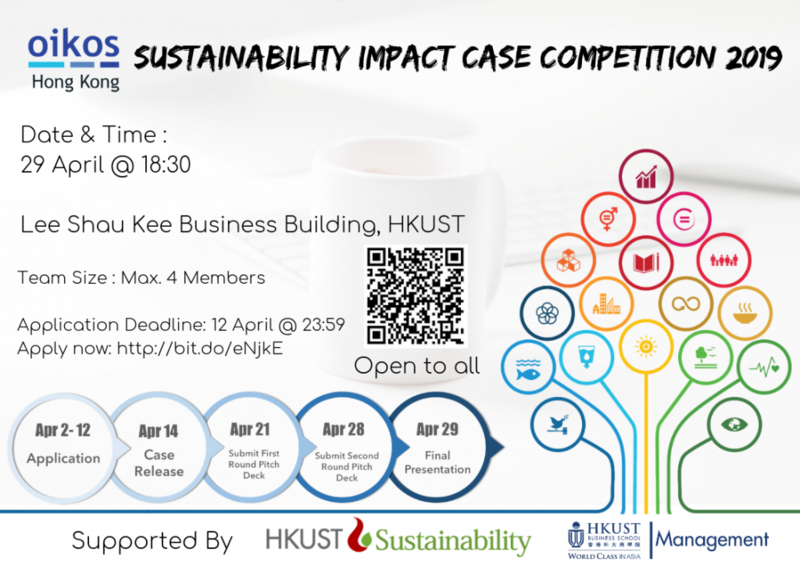 oikos Hong Kong is pleased to hold our Sustainability Impact Case Competition (SICC) on 29 April 2019. The winning team will be qualified to take part in the oikos International FutureLab in Geneva in this coming fall with sponsorship. Special thanks to HKUST Business School Department of Management, HKUST Sustainability Unit and HKUST Student Enrichment Activities Fund (SEA Fund) for supporting the competition. ALL HKUST students are welcomed to apply! Waiting for all of your applications and proficient solutions ahead! Certificates will be given to all participants to recognise your effort. The case question will be sent to team leaders on 14th April 2019. After the preliminary round, you will have to conduct a presentation to our judges after modifying your pitch deck. The champion team will win a sponsorship (Total Worth: HK$5,000) to represent Hong Kong and HKUST at the oikos International FutureLab in Geneva, Switzerland this coming fall. The champion team will need to take care of their own transportation expenses to and from Geneva. Follow us on Facebook, Instagram & LinkedIn.